Enjoy the spectacular birds-eye views on a Fly-In safari in South Africa, watching the savanna unfold at the horizon as you fly from lodge to lodge, observing Africa's wilderness and scenery from a totally different perspective. For those who have a limited amount of time it is the perfect way to experience as much as possible of the country's natural beauty and wildlife. Any worries about logistics, arrangements, documents etc., will be taken care of, you can just relax and enjoy. Usually you will be picked up from your port of entry into South Africa and from there you just let go while being flown to your first lodge or camp. From there you will fly from the one lodge or camp to the next, depending on the itinerary you have chosen. Lodges and camps are mostly of an up-market and luxurious nature with their own private landing strips. Visitors with a very tight time frame also have the option to do a one camp visit only, where they will stay for the number of days available to them. On the ground you will be taken on game drives that are designed to maximize your wildlife and scenery viewing experience. 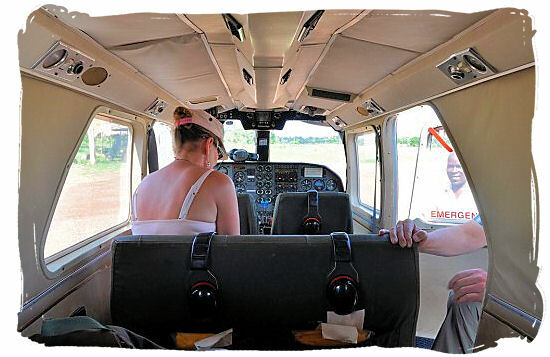 Depending on the type of Fly-in safari you have chosen, your pilot is often also your personal guide, staying with you with his aircraft, taking you from lodge to lodge at your convenience. Next to viewing wildlife and scenery on ground level, a Fly-in safari adds an extra dimension to your safari experience by allowing you to see animals and landscapes from a bird's eye view. A great advantage of Fly-in safaris is, that you can visit a substantial number of wildlife reserves in different countries within a reasonable period of time. For that reason they are a popular option for visiting reserves in countries such as Namibia, Botswana, Zimbabwe and the southern and northern regions of Zambia, Kenya and Tanzania. In as little as 4 or 5 days for example, you can complete a safari that starts of in Johannesburg South Africa, visit camps in the Okavango Delta in Botswana, continues to Zambia to visit the South Luangwa National Park and then returns to South Africa. The aircraft most widely used on Fly-In safaris, are the Cessna 206, 210 and 208 Caravan, twin-engine Kingairs and Islanders, as well as a variety of small private jet aircraft. Fly-In Safaris - comparison guide Compare more than 300 Fly-In African Safari tours spread across the top 8 safari countries in Southern Africa with user reviews and ratings, itineraries, pricing, comfort levels, specialization, etc. Find the best Fly-In safari tour to suit your preferences and budget, they are available at all levels of comfort and luxury. Compare more than 300 Fly-In African Safari tours spread across the top 8 safari countries in Southern Africa with user reviews and ratings, itineraries, pricing, comfort levels, specialization, etc. Find the best Fly-In safari tour to suit your preferences and budget, they are available at all levels of comfort and luxury. A twin engine Britten-Norman Islander airplane on an airstrip in the African bush, ready for take-off, just waiting for the luggage to be loaded. Usually located conveniently near to a lodge or camp these bush strips can greatly vary in structure, condition and size such as gravel, grass, downhill, uphill, narrow, short and sometimes even tarred. 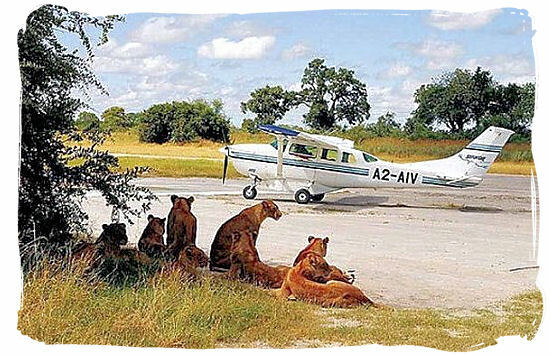 Bush pilots receive special training to deal with the intricacies of bush flying. Next to the King Air 200 and the Britten-Norman Islander, the planes mostly used for fly-in safaris are the Cessna 206, Cessna 210, Cessna 208 Caravan, Cessna 406 and the Pilatus PC-12. The inside of a Britten-Norman Islander airplane. Specially designed for short-haul flying to remote locations, it will normally accommodate 9 passengers and a crew of 1 or 2 pilots. Once aboard the aircraft you will enjoy the spacious cabin and the comfortable seats. The design of the cabin allows for quick transformation for different usages such as parachuting, cargo transport and air ambulance services. Because of its ability to fly short distances and to land on very short dirt-strip type of airfields, it is a popular aircraft for the transportation of fly-in safaris in Africa. Pride of Lions as reception committee at an airstrip in the bushveld. In fact, it could also be a farewell party. Nevertheless, you should not be surprised to find the airstrip to be annexed by antelopes and other wildlife like this bunch of Lions when you arrive at your destination. Usually the pilot will make a couple of passes over the strip to chase them away. 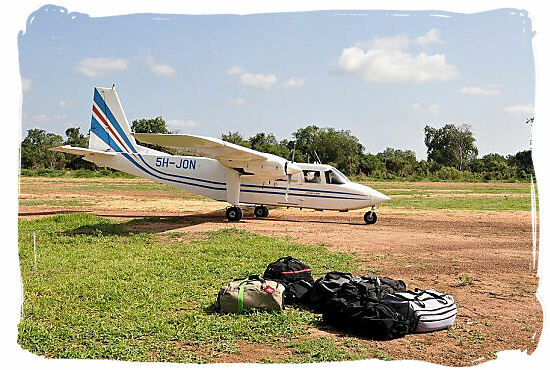 Alternatively the staff from the nearby lodge who have come to transfer you to or from your accommodation will make sure that it is cleared for landing or take off of the aircraft. 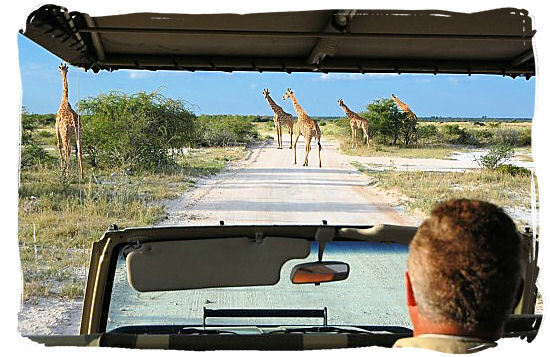 Giraffes encounter on a game drive in the Etosha National Park in Namibia. Situated in the north of Namibia, a large portion (23%) of the 22,270 km (8,598 sq mi) Park is one huge salt pan. So large that it is visible from space. Game viewing in Etosha is known to be excellent, especially around the water holes. The Park is home to almost 114 mammal species, including 4 members of the Big Five, namely Lions, Leopards, Elephants and Rhinos. Other large animals to be found are Wildebeest, Giraffes, Hyenas, Cheetahs, Gemsbok (Oryx), kudus, Zebras, Eland's and many more. On top of one of the famous sand dunes at Sossusvlei in the Naukluft National Park, a unique experience. The Park is situated in the Namib desert in Namibia, which is a coastal stretching for more than 2,000 kilometers (1,200) miles all along the Atlantic coasts of Angola, Namibia and South Africa. 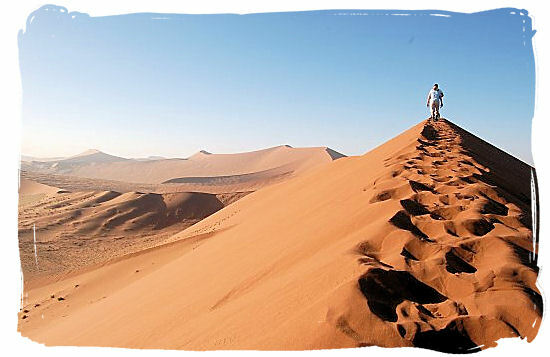 Consisting of seas sand and gravel plains, the latter with a scattering of rocky mountain, the Namib desert is famous for its up to 300 meters (980 feet) high sand dunes spanning many kilometers such as at Sossusvlei. The Namib is uninhabited except for a few small pastoral settlements in the northern and central regions. To give you an idea of the different planes that are most often being used for fly-in safaris, here is a short review. When on a fly-in safari you are likely to be flying between lodges and camps in one of the light aircraft shown in the video. Hop on board and join Coastal Aviation's safari bush-to-beach Fly-In safari from Dar to Ruaha, Lake Manyara, Ngorongoro, Serengeti and Zanzibar. Calling themselves the "Flying Safari company", Coastal Aviation is an air service company located in Tanzania that operates flights to a network of safari destinations in Eastern Africa, flying to some 100 different air fields and strips in national parks, game reserves and coastal tourism paradises. Short video of a Fly-In safari also with Coastal Aviation in Southern Tanzania, the itinerary this time is the Selous Game Reserve, Fanjove Private Island and Dar es Salaam. Join this Fly-In safari to Selinda camp in the Okavango delta in Botswana. Overlooking the flood plains of the Selinda Spillway, a waterway that connects the game-rich flood plains of the Linyanti wetlands with the Okavango Delta, Selinda is a luxurious and intimate tented camp situated in a 135,000 hectares ( 330,00 acres) wildlife region in Botswana. Follow the adventures of two private pilots on a self-fly safari in Southern Africa and enjoy stunning views of the Victoria Falls from the air. If you are a pilot you can do this yourself. It is the equivalent of a self-drive safari. All you need to do is rent an aircraft, plan your itinerary and fly to your desired destinations.